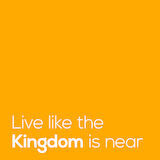 Welcome to Trinity At Trinity, our passion is to see people embrace the call to live like the Kingdom is near. But what does that actually mean for us? How do we grapple with the now-and-not-yet tension; partially experiencing Kingdom life through our relationship with God but still waiting for it to come in all its fullness? Although there are many things we don’t know about the nature of God’s Kingdom, the Bible doesn’t leave us in the dark: the Beatitudes, found in Matthew 5, describe the key blessings and promises of the Kingdom and the character of those who live in it. So we know that Kingdom life involves humility, dependence on God’s comfort, gentleness, hunger for the right ways of God, mercy towards others, purity in deeds and motives, a passion for peace and a willingness to face opposition, even persecution, for his sake. Therefore we want those Kingdom values to permeate every area of our lives, affecting how we live and work each day, how we learn more of God and how we lead his people in being a light to the world. Relationship is at the core of the gospel message, so it’s no surprise that people often judge the truth and value of that message by the quality and integrity of the community which proclaims it. That’s why it’s so important for us to not only talk about God’s coming Kingdom but to live whole lives that reflect and draw people towards him. We know that we’re all equally undeserving before God, yet all equally redeemed and loved, so regardless of our role in the community each of us expects to both shape and learn from others. We believe there really is beauty in holiness and we’re wholeheartedly pursuing it, wanting a Christ-like character to be recognisable in every member of our community. We believe that all followers of Jesus are united by an identity in him, regardless of background, leadership style or theological views, and our task is to love one another as we stay focused on the mission he’s given us. We aim to graciously but honestly confront our weaknesses together, so that we can know God’s forgiveness and healing and extend that invitation of wholeness to others. We want the compassion of God to be evident in our lives, teaching us to make sure that people who are vulnerable or oppressed are protected, loved and given a voice. We encourage one another towards servant-hearted living, learning and leading, striving for all our interactions to be characterised by gentleness, kindness and a deep love for others. We aim to learn and worship together in a way that allows the Holy Spirit to move through every activity, reminding us that everything we do is ultimately about better knowing, loving and serving God. Courage Blessed are those who are persecuted because of righteousness, for theirs is the Kingdom We strive to be courageous leaders, passionately and persistently sharing the good news of the Kingdom and living out its values in every area of our lives. We have the chance to eat lunch together as a community every weekday, the cost of which is included in full-time student fees, and it’s a great way to build strong friendships, debate ideas that have come up in lectures, or quiz faculty members about tough topics. Spouses and children are always welcome at mealtimes too. We know that where and how you make your home has a big impact on what you’re able to gain from and give to the community during your time here, and that’s especially true for those relocating to Bristol to study with us. In addition to the many properties Trinity owns or leases, most within a threemile radius of the college, we can also house up to 30 people in our on-site accommodation, and our admissions team will happily talk with you about which of our accommodation options would suit you best. We try to make sure that Kingdom values are threaded through every part of life at Trinity, from coffee breaks and shared meal times to chapel services, lectures and small groups. That’s not an easy task, but we invite you to join us in it. Designed to give spouses of Trinity students a chance to regularly meet together, our Connect group provides space for worship, prayer, pastoral care, personal development, theological learning and the building of friendships that will help support your whole family throughout your time at Trinity and beyond. Trinity College Day Nursery We have our own Ofsted-registered day nursery on campus which, as well as serving the families of Trinity students, is also open to the public, so it offers a great chance to get to know other families in the local area. The children of full-time Trinity students are able to attend for a significantly subsidised fee. Living in Bristol A lively student city, Bristol is home to two large universities so it has a good network of buses, plenty of parks and open spaces, great shops, several interesting art galleries and museums, lots of theatres and live music venues, a beautiful cathedral and more good restaurants than anyone on a student budget will ever be able to get through! You’ll also find it to be a very familyfriendly city, with the @Bristol planetarium and hands-on science centre, the Aquarium, a large zoo and the annual hot-air balloon fiesta and kite festival. The qualifications you can pursue with us: Undergraduate study in Theology, Ministry and Mission • Certificate (one year) • Diploma (two years) • BA (Hons) (three years) Graduate study in Theology, Ministry and Mission • GradDip (one year) Postgraduate study in Theology, Ministry and Mission • PGDip (one year) • MA (one year) • MPhil, MLitt and PhD (see page 14) Our taught Theology programmes are accredited by Durham University. Theology at Trinity is vibrant, challenging, dynamic, Spirit-filled and ultimately the intellectual life-blood of the missional church. So whether you’re thinking about church leadership or mission, or you’re aiming to take your theological learning into the mainstream world of work, this is the place to engage with the Word of God. If you’re applying from overseas then take a look at trinitycollegebristol.ac.uk/ internationals to find out more about becoming a student at Trinity and the academic and practical implications of studying in another country. alongside your work and family commitments. Even if you don’t want to aim for an accredited qualification, you can still work towards an internal college award (the Trinity Foundation Certificate) or just sign up for one module at a time. Our evangelical ethos means we take Scripture very seriously and it stands at the core of all our academic programmes. You can choose to engage with the Bible through detailed study of a particular book or theme in a biblical studies module; you can focus on leadership topics such as preaching, mission, pastoral care, or discipleship; you can dig into the details of doctrine and church history; and you can explore how Theology interacts with the world around us with modules on multifaith awareness, Theology and the environment, or Christian ethics. If you have a learning difficulty or a disability then trinitycollegebristol.ac.uk/ learningsupport will give you more information about how our Disability Adviser and Study Support Tutor can help you during your time at Trinity. 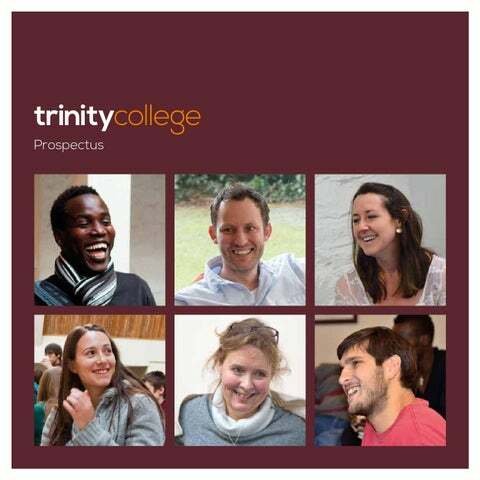 See trinitycollegebristol.ac.uk/ theologyprogrammes for a more detailed module list and to find out more about entry requirements, fees and our timetable. Some of our postgraduate students are based with us in Bristol and others are spread out across the world, but all share Trinity’s Kingdom-focused approach to theological learning and are engaging with a variety of academic and practical topics in the context of vibrant personal faith and a commitment to mission. We offer several degrees at Masters and Doctoral levels and have a range of gifted scholars and prominent experts on our faculty who are experienced in supervising research. We also have access to other specialists through our various Associate Faculty, our partner Bristol Baptist College and our wider theological and academic links. We currently have almost 50 research students exploring new frontiers of Theology through our postgraduate research programme. If you study through us you will be assigned an internal supervisor from within the Trinity community, who will have expertise in your chosen field and whose job it is to advise, guide and encourage you in your work. If you choose to do your research from a distance we will work with you to find an additional supervisor closer to home, appropriately experienced and qualified, so that you have the best possible support. You’ll also be expected to come to the college at least once per year, to connect with your supervisor and your fellow researchers, to attend (and possibly present at) our annual research conference and to engage with the wider Trinity community. Whatever your area of interest, we would love to talk further with you about how Trinity could help you delve deeper into it. See trinitycollegebristol.ac.uk/ research for more information. At Trinity weâ&#x20AC;&#x2122;re preparing people to live Kingdom lives, the source of which must be our relationship with God, through Jesus, in the power of the Holy Spirit. So we make it a priority to establish patterns of prayer and worship which allow us to regularly hear from and offer ourselves to God. Worship and prayer We begin every day with worship and prayer together in our morning chapel services and we meet for Communion as a whole community once a week. Pastoral groups Full-time students have the opportunity to be in a pastoral group, meeting weekly with 8-10 others for worship, prayer and theological reflection. Silence The whole college observes an hour of silence each week and we also have three quiet days each year. These offer different opportunities for personal and corporate reflection, prayer and spiritual growth. Prayer triplets The forming of prayer triplets is a key part of our community life, helping make sure that personal support, encouragement and accountability are available for every individual. These relationships will often continue to provide valuable support well beyond your time at Trinity. Now is both an exciting and very challenging time to be a Christian leader. We’re faced with the task of re-evangelising our society, but in the context of a nation that has largely forgotten or dismissed the basic message of Christianity which once shaped its values and its way of life. In an age when Christianity is seen as irrelevant or even destructive, how can we lead communities of faith in living out a message which is genuinely good news? principles, Kingdom character traits and values, that Jesus tells us need to guide our lives and our ministries. Ultimately we believe that God has given us the task of shaping leaders of Christ-like character in community for a missional church. So that’s what you’ll be signing up for if you join us: being rooted in a diverse, lively, supportive family of people encouraging one another to be leaders who passionately pursue God and his Kingdom so that more people can know the joy of relationship with him. Our ordination programmes are particularly geared towards training people for ministry in the Church of England, although a number of our students are preparing for service in different denominations or in other provinces of the Anglican Communion. Trinity offers you the ability to switch between training modes from year to year if you need to, so no matter what changes in your church, work or family life, your training is always the best fit for your situation. A good portion of your time will be spent learning through lectures and seminars; tackling practical, pastoral and theological issues in small groups; and worshipping and praying your way through this training period alongside others in the community. Yet you’ll also be involved with a local church, helping to lead and serve the congregation both on Sundays and throughout the week. This immersion in a learning and formational community allows you to engage with the Bible in an in-depth way alongside practical, contextual ministry experience. Half of your time will be spent working for a church and the other half will be spent studying, with one day per week here at college. You’ll dive briefly but deeply into a range of lectures, seminars and discussion groups, then head back into your church context to put it all to work in daily ministry, often moving from theory to practice in the space of 24 hours. This immersion in a ministerial context gives you a unique opportunity to apply your learning to your leadership and ministry work almost instantly. This programme is flexible, so you can work full- or part-time while you study. The majority of the teaching happens in the evenings or at weekends, but you’ll still share some classes with other full-time students. Alongside your work you’ll be engaging with Theology in practical and academic ways, enjoying a range of lectures, seminars and small group work as well as getting the chance to put your learning into practice in a local church context. Sundays kick-start your involvement in your local church throughout the week; Mondays are study days; our main lecture days are Tuesdays, Thursdays and Fridays; and Wednesdays are the main space safeguarded for personal and community spiritual development. If you don’t already have a degree then you’ll most likely work towards either the Diploma or the BA; if you do already have a degree (2:1 or above) then some combination of the GradDip/PGDip and MA will probably suit you best. You’ll have one day per week at college, at least one day for personal study and up to three days to work at a church. The only fixed day is your college day, which will be a Tuesday; the remaining days can be divided up in whatever way works best for you and your church. You’ll also be expected to take part in four study weekends, a seven-day summer school and a five-day Integrated Learning Week each year. If you train for ordination non-residentially, you’ll work towards either a Diploma or BA in Theology, Ministry and Mission. The Diploma takes two years to complete and the BA takes three years. Your main teaching sessions will be on Tuesday evenings, although you can choose to take modules from the full-time programme on Tuesdays, Thursdays and Fridays if that fits your schedule. You’ll also be expected to take part in five study weekends, a seven-day summer school and a fiveday Integrated Learning Week each year. If you train for ordination part-time, you’ll work towards a Diploma in Theology, Ministry and Mission, which takes three years to complete. Fill in an application form Find it at trinitycollegebristol.ac.uk/applynow then just email it to our admissions team and they’ll be in touch. Talk to us about an interview An interview offers a chance for us to talk more personally with you about your spiritual journey, your education and work experiences and your sense of where and what God is calling you to. You can ask about arranging one at an Open Day or by emailing our admissions team.